Today I’m preparing for my participation in a seminar on Open Cities that will be held Monday in Toronto as part of the Monday Night Seminar series by The McLuhan Centre for Culture and Technology. As part of my preparation, I thought I would take and publish an edited version of a draft of a paper that I wrote about Why Libraries Should Maintain the Open Data of Their Communities that I wrote in 2014 but never ended up publishing. The text that follows is loooong. For a shorter take, you can opt to check out my slides on the same topic from a presentation I gave at the Ontario Library Association Superconference in January of this year. Before we can have Linked Open Data, we need Open Data, and that process of education and data publishing with open licenses has been slow going (Voss 2012). It is curious that for all the professional and scholarly conversations within librarianship about Linked Open Data there is scant attention being paid to the much simpler technology of Open Data. What literature on Open Data that is found is largely situated within the larger conversation on the preservation and management of experimental data that are now required of researchers to deposit due to changes in national-level funding mandates. Not to take away from the work being applied to both Linked Open Data and Research Data Management as these are both important developments in the work of libraries, this text will put forward that libraries are not taking advantage of an opportunity to collect and manage Open Data more widely from and for their communities. By ignoring Open Data libraries are missing an opportunity to become a platform by which new works by and about their community can be built. Indeed, there are those outside of the profession who have expressed that libraries would do well to address this need. “Open data is data that meets the criteria of intelligent openness. Data must be accessible, usable, assessable and intelligible”(Royal Society (Great Britain) 2012). “Open means anyone can freely access, use, modify, and share for any purpose (subject, at most, to requirements that preserve provenance and openness)”(Open Knowledge Foundation 2014). It is important to understand the consequences of using the definition of Open Data as set by the OKFN. A dataset that is made available online using the licence CC-BY-NC, or Creative Commons Attribution-NonCommercial, for example, would not be considered Open Data by the OKFN since it restricts the domain of data use to only non-commercial endeavors. On the other hand, this text will accept any data – even unstructured data in a proprietary format – that is made available freely online as long as the license has been designated as Open. This is consistent with the definition of Open Data as considered by Tim Berners-Lee, the inventor of the Web and the initiator of Linked Data. Berners-Lee holds that Open Data is a quality that can be assigned of one of five possible stars for openness (Berners-Lee 2006). Data that is available online that has been granted an open license has a quality level of one star. Openly licensed data available in a structured form such as a table is worth two stars and data that is structured using a non-proprietary format such as within a comma delimited file earns three stars. 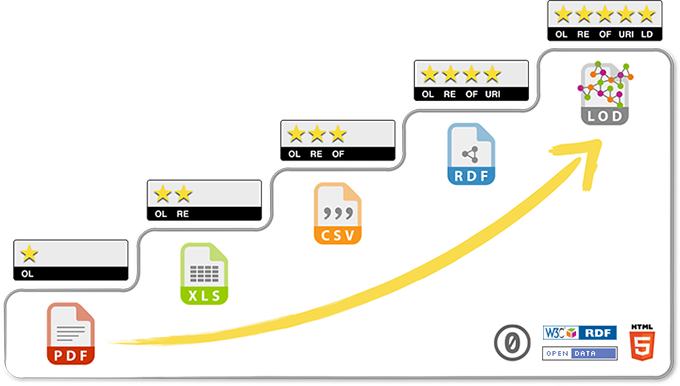 Four star open data is open licensed data that has been assigned a URI, or uniform resource identifier, so that the data can be linked to with less likelihood of breaking. And according to Berners-Lee, data with semantic metadata or Open Linked Data would be ideal and thus earns five stars. In the course of this text it will be discussed why the work involved of adding additional metadata, structure, and programmatic access to Open Data might be a new service that librarians might want to consider providing to their communities as part of our portfolio of services. “prepared by an officer or employee of the United States government as part of that person’s official duties… is not subject to copyright” and is, as such, free to copy by citizens of the United States (U.S. General Services Administration 2014). “as of November 18, 2013 Publishing and Depository Services no longer administers Crown Copyright and Licensing on behalf of Government of Canada departments and agencies. Should you be seeking copyright clearance for Government of Canada information, please contact the department or agency that created the information” (P. W. and G. S. C. Government of Canada 2007). It is still unclear whether there is a consistent approach across the departments of the federal government in regards to whether prior permission is necessary for non-commercial uses of online data of the federal government. Due to its cost-recovery mandate, access and use of many of the datasets produced by Canadian federal department of Statistics Canada require a licensing fee. These fees that are considered minimal by Statistics Canada have not only inhibited student use of its research data but it is thought to have limited the entire filed of quantitative social science research in Canada (Boyko and Watkins 2014). To alleviate this condition, Statistics Canada in 1996 established the Data Liberation Initiative (DLI) with Canadian post-secondary institutions to improve data access for students, staff and faculty. “Over the years the focus of the DLI Program has evolved from purchasing access to major Canadian datasets collected by Statistics Canada to providing training services and the continuous support required for the proper understanding and usage of an ever expanding research data collection” (S. C. Government of Canada 1996). “exclusive purposes of teaching, academic research and publishing, and/or planning of educational services within my educational institution, and may not be used for any other purposes without the explicit prior written approval of Statistics Canada” (Boyko and Watkins 2014). While libraries have been responsible for upholding obligations of signed license agreements for digital products for decades now, I think it’s important to take a moment to reflect on this behaviour that has been normalized. If libraries during the age of only print had decided to restrict the use of its collections to non-commercial sphere and would regularly interrogate our users of their intentions of how they planned to make use of the information that they found in the library before they were able to access those works, the practice would be dismissed immediately out of a respect for personal privacy. The fact that this practice has been established with no known complaint is likely for several reasons. For one, the transaction of data from Statistics Canada to the user (through the proxy of the academic library) is framed as an exchange in which the promise of non-commercialization of the data and no re-distribution of the set is given in return for data without a financial cost, as opposed to an imposed restriction on one’s rights on one’s own data. While the Data Liberation Initiative has had success in making government data more readily available for the academic researchers of Canada, it does not help bring government data to the wider public. In response, local governments, non-profit organizations and public libraries such as the Calgary Public Library, Toronto Public Library, and Regina Public Library have independently joined the Community Data Program (CDP) as established by the Canadian Council on Social Development (CCSD), to collectively acquire Statistics Canada data. It should be noted that this data is not intended to be shared with the public; rather the data is used for internal planning and decision making (Canadian Council on Social Development 2014). At one time libraries did belong to a program that made Canadian government information freely available to the Canadian public called the Federal Depository Services Program. “The original mandate of the DSP was to provide a central and comprehensive distribution source from which published Government of Canada (GC) information would be sent to academic, college, legislative and public libraries, as well as to federal parliamentarians and departmental libraries” (Government of Canada Publications 2014). The program began in 1927 and ended in 1994 when the program developed into the “E-Collection” in 1995. The distribution of print publications to libraries eventually ceased as access to their PDF equivalents were made available online. While the DSP E-Collection Program is one that distributes publications and not datasets, I believe that the program is worth mentioning in this context because it was one reason given why my own place of employment (and presumably other Canadian academic libraries) have always maintain a bank of computers that are freely available to the public. Since our library was designated a Full Depository Library in the DSP program it was held that our library had an obligation to provide unfettered and free public access to our the DSP collection beyond our campus to the wider community. I would consider this a historical precedent to possible hosting of government open data in the future. Releasing Data for Innovation – consult with users and empower future generations of innovators (data.gc.ca 2014). As of October, 2014, five of our of nation’s provincial governments host an open data portal as do over fifty municipalities (Lauriault 2014). In the next section of this text, it will be argued that there is a growing expectation that the library develops into a platform for the information needs of its community and that hosting Open Data may be one such development towards this vision. There have been a number of prominent individuals outside of the librarian profession who have advocated that libraries must go beyond merely providing traditional collections if they are to remain a relevant and vibrant institution in the future. In May of 2011 writer Seth Godwin declared that “The library is no longer a warehouse for dead books” and instead suggested a new vision of the library: “there are one thousand things that could be done in a place like this, all built around one mission: take the world of data, combine it with the people in this community and create value” (Godin 2011). In October of 2013, MG Siegler, who is a general partner at Google Ventures, declared “The End of the Library” in a post on TechCrunch stating, “The internet has replaced the importance of libraries as a repository for knowledge. And digital distribution has replaced the role of a library as a central hub for obtaining the containers of such knowledge: books” (Siegler 2013). Librarians have generally not been receptive to these interjections. One of the strongest rebuttals to the MG Siegler article addresses the comfortable privilege of Siegler and other writers in the “End of the Library trope” (Berg 2013). While these writers might not need libraries personally, Berg argues, it is a mistake for them to insist that this means that everyone else in the community is in the same situation and to ignore the less fortunate. Indeed, there is still a considerably large population who need and use libraries regularly for access to reading materials or to access digital sources of information (Zickuhr, Purcell, and Rainie 2014). While acknowledging this particular weakness and their other shortcomings I would like to suggest that within many of these “Death of the Library” pieces is also evidence that there is a segment of our population who are no longer not well served by primarily collection-based libraries of items that can be readily acquired through commercial channels. 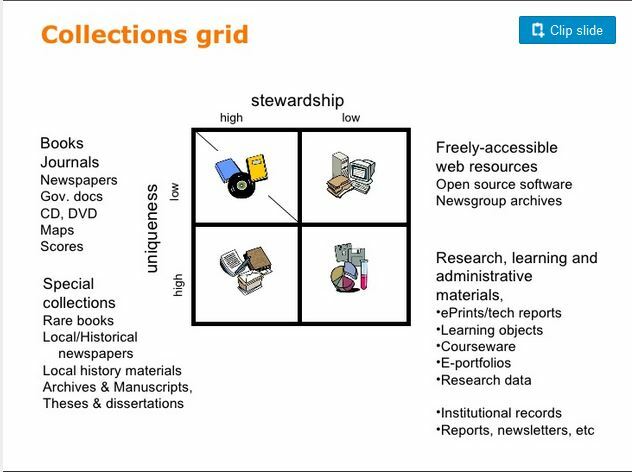 Before I extend this argument, I would like to locate this observation in the context of the Collections Grid model developed by Lorcan Dempsey and Eric Childress that takes in account the changes in library collection development that have come about in an increased networked environment (Dempsey, Malpas, and Lavoie 2014). organizes resources according to two values: uniqueness and stewardship/scarcity. Resources that are unique, or rare, tend to be in one collection only. Resources that are not unique or rare tend to be in many collections. At the nonunique end of this spectrum are commodity materials, which are widely published or available through many channels. Resources that are highly stewarded are things that attract library attention, have resources and time spent on them, have systems infrastructure devoted to them, and so on. Stewardship and scarcity tend to go together: we have developed stewardship models for materials that are relatively scarce. This gives us four quadrants. One of the most succinct expressions of this growing expectation that a library should be more than traditionally collection-based comes from within librarianship. R. David Lankes, professor and Dean’s Scholar for the New Librarianship at Syracuse University’s School of Information Studies wrote in 2013, “Bad Libraries build collections. Good libraries build services (of which a collection is only one). Great libraries build Communities” (Lankes 2014). This statement fits comfortably within Lankes’ larger Mission for Librarians which framed his Atlas of New Librarianship: “The mission of librarians is to improve society through facilitating knowledge creation in their communities” (Lankes 2011). There is evidence that those from outside of librarianship are starting to understand the potential of libraries in this particular context. During the month of September 2014 the Knight Foundation began a Knight News Challenge as a means to distribute a share of $2.5 million in funding. The challenge issued was “How might we leverage libraries as a platform to build more knowledgeable communities?” (Bracken 2014). Of the 680 public entries that were submitted, 13 of the Knight Foundation Challenge entries mentioned Open Data explicitly. One such the entry was entitled “From open data to open knowledge: Using libraries to turn civic data into a valuable resource for citizens, researchers, and City Hall alike.” It, like many of these challenge responses, identify a need for librarians to improve the context of existing open data and “to help ensure that our data becomes part of the valuable collection of information they make available to their users” (Franklin-Hodge 2014). Some of the key motivations for open data initiatives are to promote transparency of decision-making, create accountability for elected and appointed officials, and spur greater citizen engagement. In addition, however, it is increasingly clear that open data can also enable the creation of economic value beyond the walls of the governments and institutions that share their data. This data can not only be used to help increase the productivity of existing companies and institutions, it also can spur the creation of entrepreneurial businesses and improve the welfare of individual consumers and citizens (Chui, Farrell, and Van Kuiken 2013). As stated previously in the discussion of the Data Liberation Initiative of Statistics Canada, the argument that Canadian government data is best served on a cost-recovery basis has been challenged. The little research that has been done into this subject has suggested that charging for government data almost never yields much money, and often actually serves as a loss creating mechanism. Indeed a 2001 KPMG study of Canadian geospatial data found government almost never made money from data sales if purchases by other levels of government were not included (Eaves 2013). The open data movement has propagated a shifting notion of who the users of data are. In the long history of data, citizens were always considered to be end-users who provided their data to the collector and then interfaced with the end-products of data-driven government innovations. In this new vision, government concedes that citizens can best define and resolve the problems that plague their own communities—implying that communities should take the data provided and use it to address their needs (Deahl 2014). Were a library to collect and analyze its internal data and integrate it with publicly available data, it could improve the efficiency of workflows and provide evidence-based support for program development. Sharing library data such as in-branch technology, usage, anonymized circulation statistics, and catalogue metadata improves the organization’s transparency and can provide citizens with insight into the value of the library (Carruthers 2014). Librarians could have additional reasons why libraries should collect and might make use of Open Data to facilitate knowledge creation in their communities and this will be explored in the next section of this text. “We wanted people to understand what it is and what they could do with it all within the broader context of fostering data literacy in our community”(#HackUOBiblio – Libraries, Hacking, and Open Data 2014). Elsewhere, she and the organizers of HackUOBiblio have stated that such hackathons are useful in as a means to teach data literacy skills (Weatherall 2014). In their presentation “Hacking the city: Libraries and the open data movement”, Alex Carruthers of the Edmonton Public Library and Lydia Zvyagintseva, MLIS/MA Candidate of the University of Alberta and founder of HackYEG, continued the theme of the Open Data, libraries and the need for greater data literacy (Hacking the City: Libraries and the Open Data Movement 2014). Despite the very compelling rhetoric of government transparency and civic engagement, studies suggest that in practice open data access appears to benefit government and the entrepreneurial class more than the public at large who find data difficult to interpret. The general public relies on applications developed by the entrepreneurial class to make sense of data. We believe libraries are well positioned to play a strategic role in developing skills required for citizens to navigate the expanding data landscape. Further on in their talk, Carruthers and Zvyagintse cite the work of Prado and Marzel, “Determining Data Information Literacy Needs: A Study of Students and Research Faculty” in their conclusion that the increasing importance of data in our civic lives “require public, school and academic libraries to contribute to both data and information literacy, as part of their larger mission to further knowledge and innovation in their respective fields of action” (Calzada and Marzal 2013). “We didn’t build libraries for a literate citizenry. We built libraries to help citizens become literate. Today we build open data portals not because we have public policy literate citizens, we build them so that citizens may become literate in public policy” (Eaves 2014). When we think of libraries, we often just think of a building with books. But 19th century [libraries] mattered not only because they had books, but because they offered literacy programs, books clubs, and other resources to help citizens become literate and thus, more engaged and productive. Open data catalogs need to learn the same lesson. While they won’t require the same centralized and costly approach as the 19th century, governments that help foster communities around open data, that encourage their school system to use it as a basis for teaching, and then support their citizens’ efforts to write and suggest their own public policy ideas will, I suspect, benefit from happier and more engaged citizens, along with better services and stronger economies. Eaves ends his post with this challenge: “So what is your government/university/community doing to create its citizen army of open data analysts?” And in response several readers commented that libraries again are well positioned to help create citizens that are data literate. Our main argument then is that hosting and supporting hackathons aligns with larger missions of libraries which is to foster literacies and build communities and specifically, by bringing together people and information, hackathons support digital literacy, they foster civic engagement and leverage community knowledge. And when we talk about civic engagement, building communities, we are really talking about participatory culture which is a value that the open data movement and libraries share. Building on the Map Warper’s success, WOTM has undoubtedly impacted the internal conversation at NYPL around digital strategy, user engagement and collections policy. It has helped shift the attention, at least in part, away from static online exhibitions, which notoriously struggle to retain users’ attention, toward participation-oriented Web sites with longer life cycles, involving the public in the grand (if painstaking) work of building the digital library. It has also jumpstarted policy discussions around user-contributed content and its relation to Library-authored metadata (Vershbow 2013). If the process of crowdsourcing digitized collections can be described as public participation in public memory (Vershbow 2013), perhaps Open Data hackathons and library support for Open Data can be framed as participation in the creation of public understanding. The actualization of the digital library has taken on a particular form, one that presents considerable danger to libraries and our readers. We have allowed commercial interests to claim “ownership” of the scholarly record through digitization and publishing. In doing so we have allowed an unhealthy system to grow. This system leads to libraries that have been hollowed out, reduced to access points with librarians as skilled product trainers, while the publishers themselves profit handsomely from the labour of the very scholars we support and from the citizens whose taxes support us all. Open Data, by its very definition of being open, is resistant to enclosure while allowing for commercial use. This is because while a license is open, copies of the data are allowed to be made which can remain under open license even if the original dataset is updated with more restrictive licensing (Munro 2014). While many municipal governments and federal and provincial government departments make Open Data available, there is no promise or obligation to maintain or perpetually host those datasets, unless those governments are otherwise directed by an internal policy. This suggests that libraries may have a role in the collection and preservation of Open Data in their community, if just to be a source of dataset redundancy in case the original datasets are removed without sufficient notice. At the time of this text’s composition (2014) there is only small group of public libraries, including the Vancouver Public Library and Edmonton Public Library, that host Open Data, but at this time, the data that these libraries make available are from their own organization only. The only exception that it is known to the author is the Open Chattanooga project, “a collaborative between the City of Chattanooga, the Chattanooga Public Library and the Open Chattanooga Brigade” (Open Chattanooga 2014). But librarians, like those previously mentioned in Edmonton, Alberta and Ottawa, Ontario and others such as the Cleveland (Ohio) Public Library, have been engaged with their community’s civic hacking communities and have been helping facilitate their use of open data (Greenwalt 2014). It is hoped that the number of librarians and libraries engage in open data continue to grow so that the benefits of such collection work – increased institutional transparency, stronger community engagement, improved data literacy, and the prevention against public commons enclosure – can be open to all. Berg, Jacobs. 2013. “The End of ‘The End of Libraries.’” BeerBrarian. October 15. http://beerbrarian.blogspot.ca/2013/10/the-end-of-end-of-libraries.html. Berners-Lee, Tim. 2006. “Linked Data – Design Issues.” W3C. July 27. http://www.w3.org/DesignIssues/LinkedData.html. Boyko, Ernie, and Wendy Watkins. 2014. “The Canadian Data Liberation Initiative: An Idea Worth Considering?” 006. IHSN Working Paper. International Household Survey Network. http://www.ihsn.org/home/sites/default/files/resources/IHSN-WP006.pdf. Bracken, John. 2014. “Knight News Challenge: Libraries Opens for Entries.” Knight Blog. September 10. http://www.knightfoundation.org/blogs/knightblog/2014/9/10/bracken-knight-news-challenge-libraries-offers-25-million-innovative-ideas/. Calzada, Prado Javier, and Miguel Ángel Marzal. 2013. “Incorporating Data Literacy into Information Literacy Programs: Core Competencies and Contents.” Libri 63 (2): 123–34. doi:10.1515/libri-2013-0010. Canadian Council on Social Development. 2014. “About the Community Data Program | Community Data Program.” Community Data Program. Accessed September 27. http://communitydata.ca/about. Carruthers, Alex. 2014. “Open Data Day Hackathon 2014 at Edmonton Public Library.” Partnership: The Canadian Journal of Library and Information Practice and Research 9 (2). https://journal.lib.uoguelph.ca/index.php/perj/article/view/3121. CBC News. 2009. “City of Vancouver Embraces Open Data, Standards and Source.” CBC News. 22. http://www.cbc.ca/1.838987. Chignard, Simon. 2013. “A Brief History of Open Data.” Paris Tech Review. April 29. http://www.paristechreview.com/2013/03/29/brief-history-open-data/. Chui, Michael, Diana Farrell, and Steve Van Kuiken. 2013. “Generating Economic Value through Open Data.” In Beyond Transparency: Open Data and the Future of Civic Innovation. San Francisco, Calif.: Code for America Press. data.gc.ca. 2014. “G8 Open Data Charter – Canada’s Action Plan.” Data.gc.ca. February 21. http://data.gc.ca/eng/g8-open-data-charter-canadas-action-plan. Deahl, Erica Sachiyo. 2014. “Better the Data You Know: Developing Youth Data Literacy in Schools and Informal Learning Environments.” SSRN Scholarly Paper ID 2445621. Rochester, NY: Social Science Research Network. http://papers.ssrn.com/abstract=2445621. Dempsey, Lorcan, Constance Malpas, and Brian Lavoie. 2014. “Collection Directions: The Evolution of Library Collections and Collecting.” Portal: Libraries and the Academy 14 (3): 393–423. http://muse.jhu.edu/journals/portal_libraries_and_the_academy/v014/14.3.dempsey.html. Eaves, David. 2013. “The Importance of Open Data Critiques – Thoughts and Context.” Eaves.ca. November 18. http://eaves.ca/2013/11/18/the-importance-of-open-data-critiques-thoughts-and-context/. ———. 2014. “Learning from Libraries: The Literacy Challenge of Open Data.” Eaves.ca. Accessed October 21. http://eaves.ca/2010/06/10/learning-from-libraries-the-literacy-challenge-of-open-data/. Franklin-Hodge, Jascha. 2014. “From Open Data to Open Knowledge: Using Libraries to Turn Civic Data into a Valuable Resource for Citizens, Researchers, and City Hall Alike.” News Challenge. September 29. https://www.newschallenge.org/challenge/libraries/submissions/from-open-data-to-open-knowledge-using-libraries-to-turn-civic-data-into-a-valuable-resource-for-citizens-the-research-community-and-city-hall-alike. Geist, Michael. 2013. “Government of Canada Quietly Changes Its Approach to Crown Copyright.” Michael Geist. November 25. http://www.michaelgeist.ca/2013/11/crown-copyright-change/. Godin, Seth. 2011. “The Future of the Library.” Sethgodin.typepad.com. May 16. http://sethgodin.typepad.com/seths_blog/2011/05/the-future-of-the-library.html. Government of Canada Publications. 2014. “About the Depository Services Program – Government of Canada Publications.” Accessed October 4. http://www.publications.gc.ca/site/eng/programs/aboutDsp.html. Government of Canada, Public Works and Government Services Canada. 2007. “Crown Copyright and Licensing – Government of Canada Publications.” March 30. http://publications.gc.ca/site/eng/ccl/index.html. Government of Canada, Statistics Canada. 1996. “Data Liberation Initiative (DLI).” January 1. http://www.statcan.gc.ca/eng/dli/dli. Greenwalt, R. Toby. 2014. “Revisiting Open Data Practices.” Public Libraries Online. August 5. http://publiclibrariesonline.org/2014/05/revisiting-open-data-practices/. Hacking the City: Libraries and the Open Data Movement. 2014. ACCESS Conference 2014 Calgary. Calgary, Alta. http://new.livestream.com/calgarypubliclibrarylive/Access. #HackUOBiblio – Libraries, Hacking, and Open Data. 2014. ACCESS Conference 2014 Calgary. Calgary, Alta. http://new.livestream.com/calgarypubliclibrarylive/Access. Lankes, R. David. 2011. The Atlas of New Librarianship. Cambridge, Mass: MIT Press. ———. 2014. “Beyond the Bullet Points: Bad Libraries Build Collections, Good Libraries Build Services, Great Libraries Build Communities.” R. David Lankes. Accessed September 28. http://quartz.syr.edu/blog/?p=1411. Lauriault, Tracey. 2014. “Datalibre.ca · OpenData.” OpenData. Accessed October 13. http://datalibre.ca/links-resources/#Open%20Data%20Cities. Malamud, Carl. 2007. “Memorandum.” Open Government Working Group. October 22. https://public.resource.org/open_government_meeting.html. McMahon, Ronald C. 2014. “Cost Recovery and Statistics Canada.” Government Information in Canada/Information Gouvernementale Au Canada 2 (4). Accessed September 16. http://library2.usask.ca/gic/v2n4/mcmahon/mcmahon.html. Munro, Thomas. 2014. “CC-By Documents Cannot Be Re-Enclosed If Their Publisher Is Acquired.” Sauropod Vertebra Picture of the Week. October 29. http://svpow.com/2014/10/29/cc-by-documents-cannot-be-re-enclosed-if-their-publisher-is-acquired/. Open Chattanooga. 2014. “Open Chattanooga – Home.” Accessed September 28. http://openchattanooga.com/. Open Knowledge Foundation. 2014. “The Open Definition – Open Definition – Defining Open in Open Data, Open Content and Open Knowledge.” The Open Definition. Accessed December 20. http://opendefinition.org/. Royal Society (Great Britain). 2012. “Science as an Open Enterprise.” https://royalsociety.org/~/media/policy/projects/sape/2012-06-20-saoe.pdf. Siegler, MG. 2013. “The End Of The Library.” TechCrunch. October 13. http://techcrunch.com/2013/10/13/the-end-of-the-library/. Social Sciences and Humanities Research Council, Canadian Institutes of Health Research, Natural Sciences and Engineering Research Council, and Canada Foundation for Innovation. 2014. “Capitalizing on Big Data: Toward a Policy Framework for Advancing Digital Scholarship in Canada.” http://www.sshrc-crsh.gc.ca/about-au_sujet/publications/digital_scholarship_consultation_e.pdf. U.S. General Services Administration. 2014. “Copyright and Other Rights Pertaining to U.S. Government Works | USA.gov.” Accessed October 15. http://www.usa.gov/copyright.shtml. Vershbow, Ben. 2013. “NYPL Labs: Hacking the Library.” Journal of Library Administration 53 (1): 79–96. doi:10.1080/01930826.2013.756701. Villum, Christian. 2014. “‘Open-Washing’ – The Difference between Opening Your Data and Simply Making Them Available | Open Knowledge Foundation Blog.” Blog. Open Knowledge Foundation Blog. March 10. http://blog.okfn.org/2014/03/10/open-washing-the-difference-between-opening-your-data-and-simply-making-them-available/. Voss, Jon. 2012. “Radically Open Cultural Heritage Data on the Web.” Museums and the Web 2012. April 25. http://www.museumsandtheweb.com/mw2012/papers/radically_open_cultural_heritage_data_on_the_w. Weatherall, Dave. 2014. “#hackUObiblio Empowers uOttawa Students by Building Their Data Literacy Skills.” Gazette. February 26. http://www.gazette.uottawa.ca/en/2014/02/hackuobiblio-empowers-uottawa-students-by-building-their-data-literacy-skills/. Zickuhr, Kathryn, Kristen Purcell, and Lee Rainie. 2014. “From Distant Admirers to Library Lovers–and beyond.” Pew Research Center’s Internet & American Life Project. Accessed October 14. http://www.pewinternet.org/2014/03/13/library-engagement-typology/.